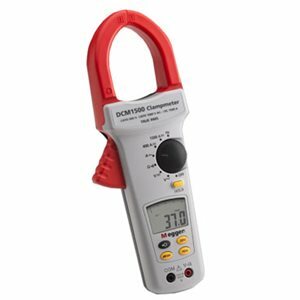 Measuring up to 1500 A ac or dc the DCM1500 also offers 750 Vac and 1000 Vdc ranges making the instrument ideal for use in the installation, maintenance, monitoring or checking of large a.c. or d.c. electrical systems and equipment. The large clear digits of the numeric display are complemented by the high-resolution digital bar graph, useful for indicating trending and fluctuation of measurement. The backlight assists use in poorly lit areas such as distribution cupboards and corners of switchrooms; and the data-hold feature enables use on difficult access cables where otherwise the display may be impossible to see.